Hey guys! Today I wanted to share a few products with you that I've used until the items were completely cleaned out. 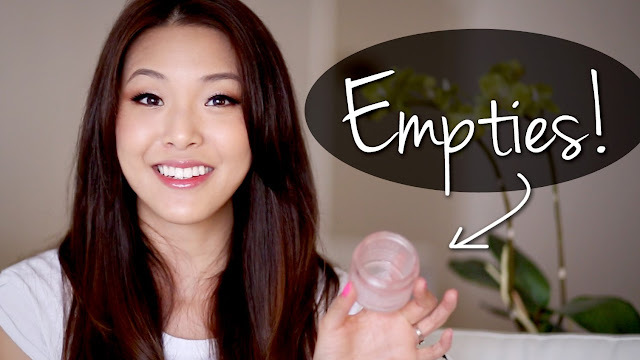 Here in the blogging world, we like to affectionately call those our "empties." I always love seeing what other peoples' empties are because it either means the product was that good or that they used it long enough to know if it wasn't. Curious as to what mine are? Find out what my recent empties are below! Let me know if any of these products are something that you'd like a full, in-depth review on individually! Sometimes when I use something so often I forget that my everyday products need love on the blog too. Readers, what are some of your recent empties? Do you try to finish whatever you have or only what you love? Let me know in the comments! I really enjoy it, but it is very similar to a lot of Asian lash glues and double eyelid glues (the kind that are whitish with a blue sheen that dry clear). They are my favorite to use on false lashes! Jen--would you recommend the Revlon glue for the single lashes? It looks like the brush-on packaging is meant for lash strips. I absolutely love seche vite. It's an absolute must have! Jen, I knew your blog a month ago and have talked my friend your posting. Thank you for having fun of make up! I must give the Clinique moisturizer a try! LOVED this video!!!! You should make it everytime you get few empties!! "It's like that motorcycle just farted...a really long fart. Ok, anyway..." LOL!!! I love your bloopers! Moving on back to Empties. These are what I keep re-purchasing--some of these for years. On my third pump. This pharmaceutical extracts the reservatrol straight from the green tea and add caffeine--supposedly one of the best antioxidant creams on the market for sensitive skin. I noticed improvement in my skin RIGHT away. It seems to target any inflammation I have and has done away with flakiness and redness. It has reduced my acne and some acne scarring since I've started. Gosh this stuff is amazing. I have itchy sensitive skin and this calms it instantly. On my third tube. Aveeno Men's Shave Gel Fragrance Free (the black tube): This gel is AMAZING for the legs too. I can get a close shave and shaving no longer irritates my skin after using this. The only bummer is that bc the foam is kind of thick, you'll need a toothbrush or something handy to wipe off the back of the razor bc it can build up but it's seriously no big once it becomes routine.. I've been absolutely adoring the Maybelline Line Stiletto Eyeliner! It doesn't irratate my eyes, nor does it come off! I actually ran for school the other day with the eyeliner on, and it didnt budge at all! Although, it does come off if you rub your eyes while they're wet. Did you dye you hair? It looks so pretty!!!! Hello! What colors from the lorac pro palette did you use on your eyes? Could you do a mini tutorial or step sequence? Im investing in the liole dollish veil bb/cc cream. Now i was wondering when it comes to cc's and bb's what order do i do makeup? bb/cc then concealer then eyes? Also can you recommend any "The Balm" products? Hi Jen, which colors you used in this Lorac palette in this video? I watched one of your videos and bought it, your eyes look so nice!!! May you tutorial you look in this video? I am really loving you hair color! Is it colored? If yes, what color did you use to achieve this rich amazing color! May I ask what body wash you use? I still haven't tried the Eyeko eyeliner but have heard amazing things. I have tried the Clinique Moisture Surge Intense, Seche Vite & Mario Badescu Drying Lotion but only repurchased MB drying lotion & Seche Vite. I felt like the moisture surge didn't do much for me. It was a nice product but I still needed a lotion afterwards, and this was in the summertime.